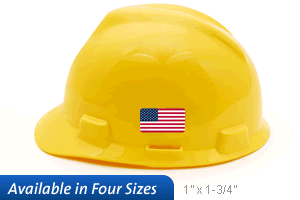 • Vinyl flag stickers are ideal for Hard hats. • Just peel off the liner and press the flag label onto any clean surface. Great products, work well for us. This was a reorder one year after original, was handled superbly off of last year's data, processed quickly and arrived on the day promised.